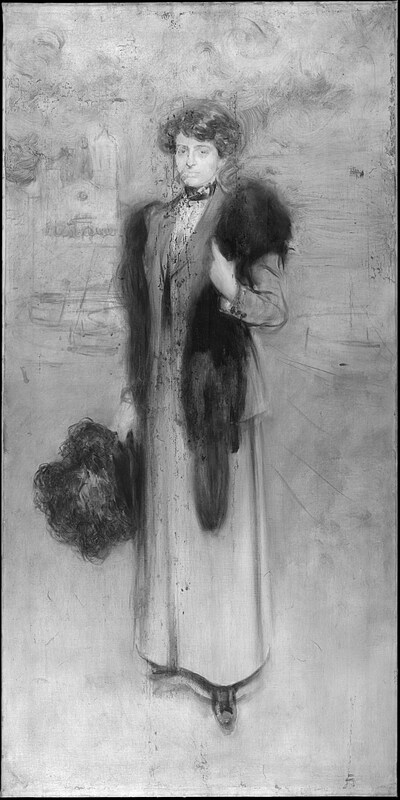 For the 150th anniversary of the birth of Ramon Casas, celebrated last year, here is what the studies carried out with infrared reflectography reveal to us about different paintings by the artist conserved in the Museu Nacional d’Art de Catalunya. 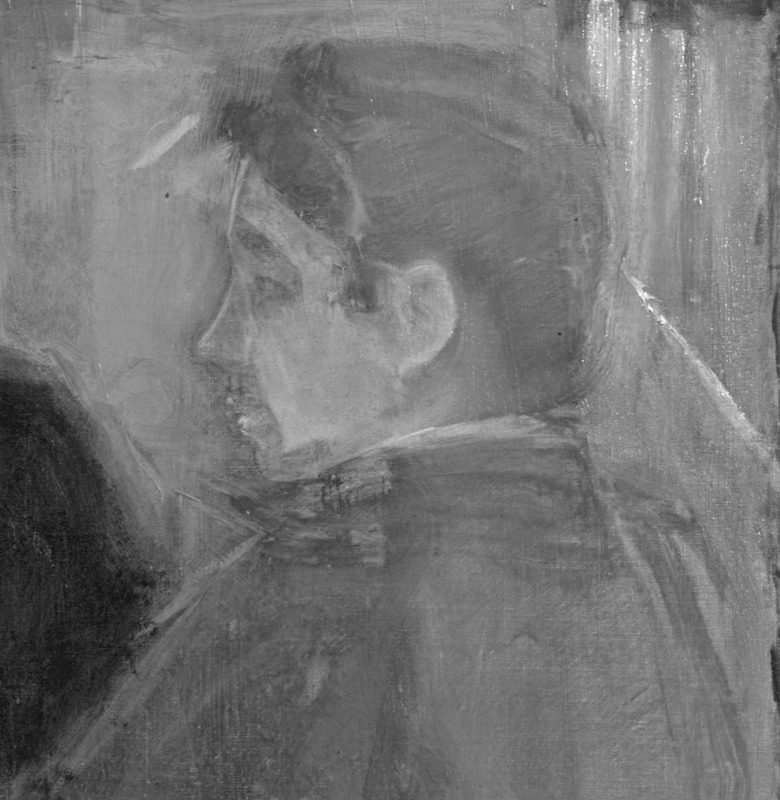 Reflectography shows that Casas sometimes approached the composition by making a first drawing in charcoal, and also that he usually constructed the forms with repeated brushstrokes that correct one another. This analysis technique, which is done using infrared radiation, moreover shows us that the underlying layers are done with vigorous, spontaneous and well-painted lines. This resource refers to the artist’s way of working in his capacity as a draughtsman and poster artist. 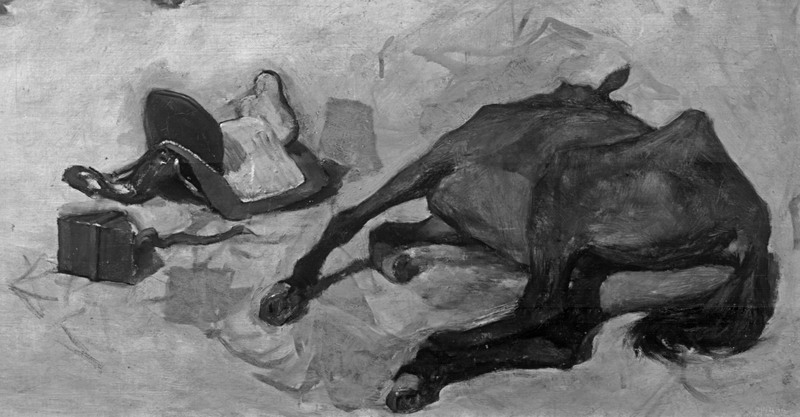 Casas painted Bulls (Dead Horses) (1886) when he was just 20 years old, and despite his youth we are surprised by the determined, precise, sharp appearance of the main motifs in the painting. However, thanks to studying it with infrared reflectography, we have seen that the artist tried different things and made changes throughout the creative process. 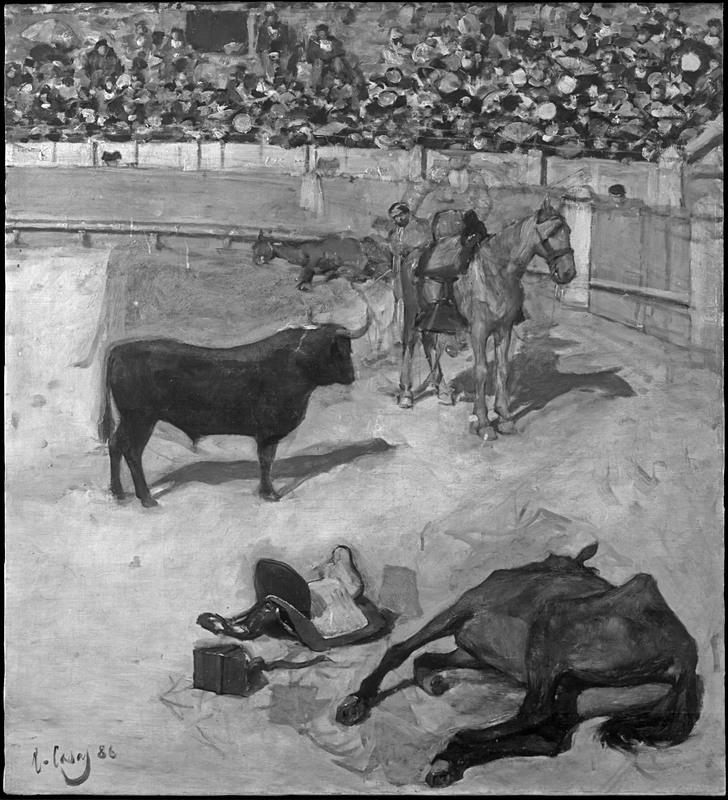 Among the most noticeable ones there is the position of the picador and his shadow, the changed places of the bull and the dead horse, the interruption of the picador’s spear, the shifting of the footrest, the variation in the diameter of the arena and the disappearance of a bullfighter in profile and another one facing us behind the barrier. Some of these changes can already be sensed just looking because the oily materials have lost their opacity over the years, but others need to be examined in order to be visible. 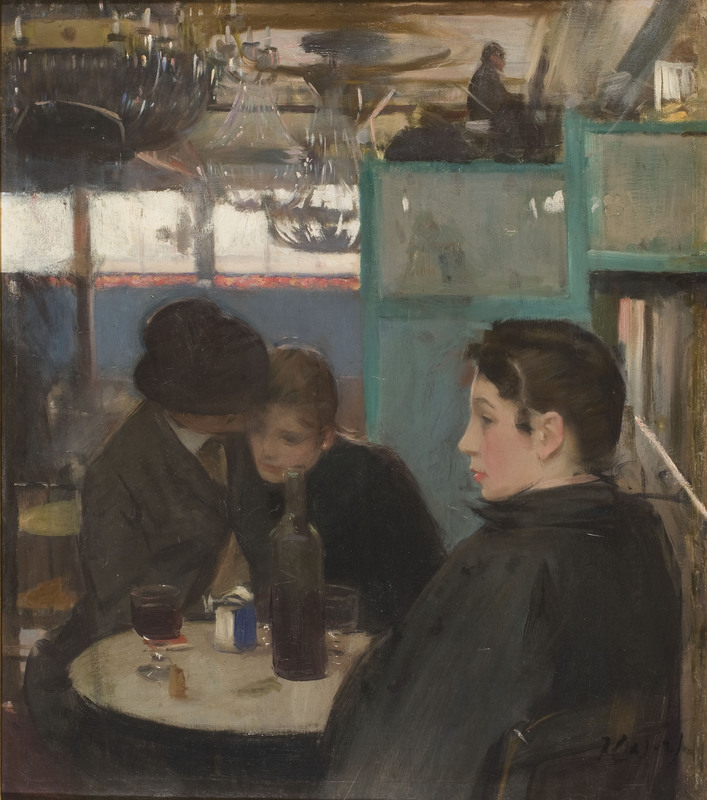 One of the works from the early years of Casas’s stay in Paris is Interior of the Moulin de la Galette (c.1890-1891). 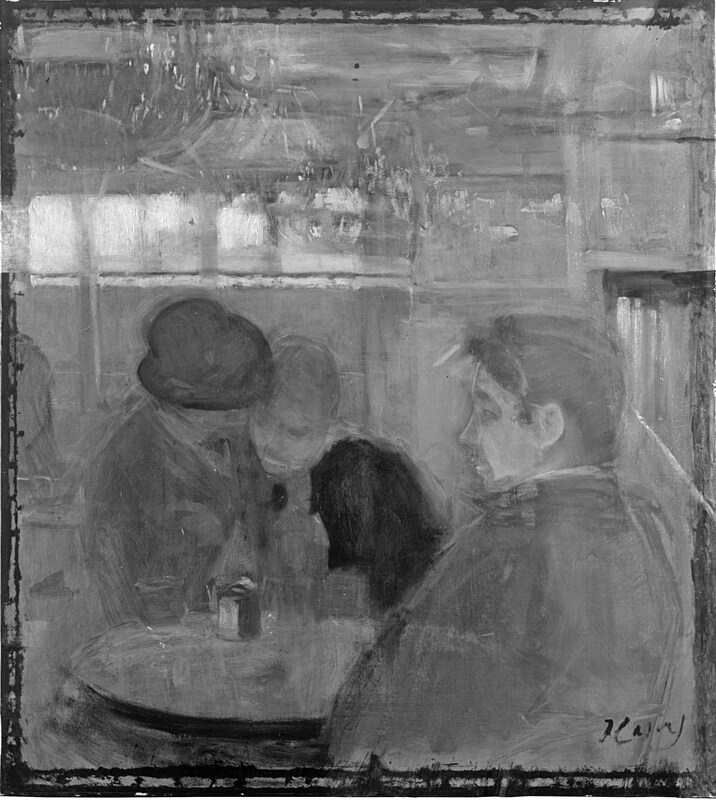 No underlying graphite or charcoal drawing appears in the reflectogram, but multiple constructive brushstrokes are observed, made successively throughout the painting process. As the work progressed, the painter made slight corrections to the outlines and other more substantial ones. Of them, the figure in the foreground is surprising. By the facial features and the shoulder, it seems rather to be that of a man than a woman. 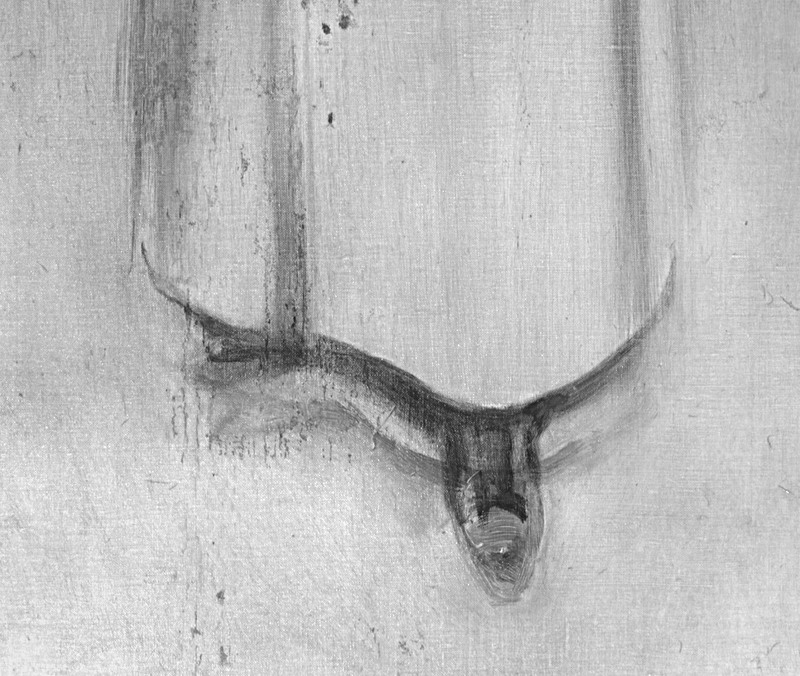 Upon analysing the reflectogram, we detect that there has been a radical change in the approach to this figure and we are left in doubt as to whether Casas originally wanted to paint it or portray someone else. Who was the figure looking at the couple of lovers? 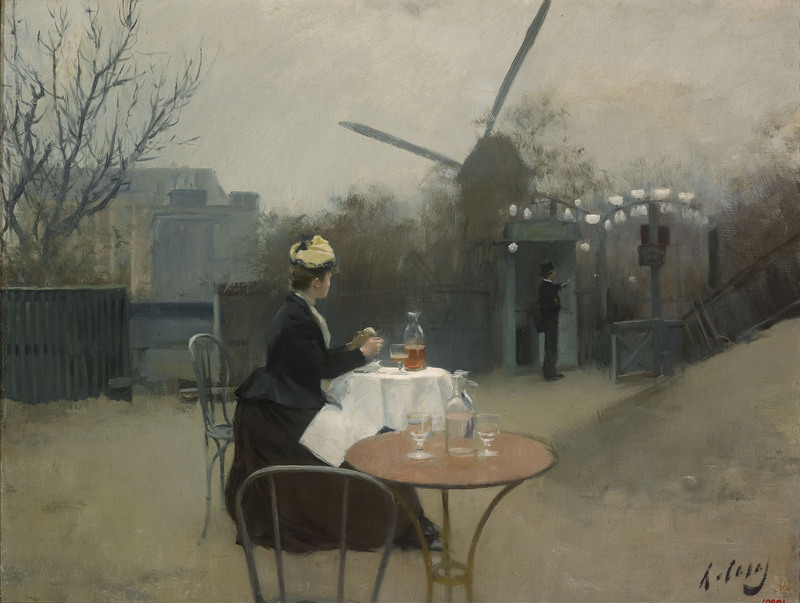 Another painting from the Paris period is the emblematic Plein Air (c.1890-1891), in which a fleeting scene is depicted, right in the middle of Montmartre. At first sight, this canvas looks like a perfectionist work with a meticulous finish. But the reflectograms captured reveal once again that Casas worked directly and with rapid resolute brushstrokes. In fact, it is painting done quickly, with no preliminary sketch and with successive coloured lines that nimbly construct the composition. 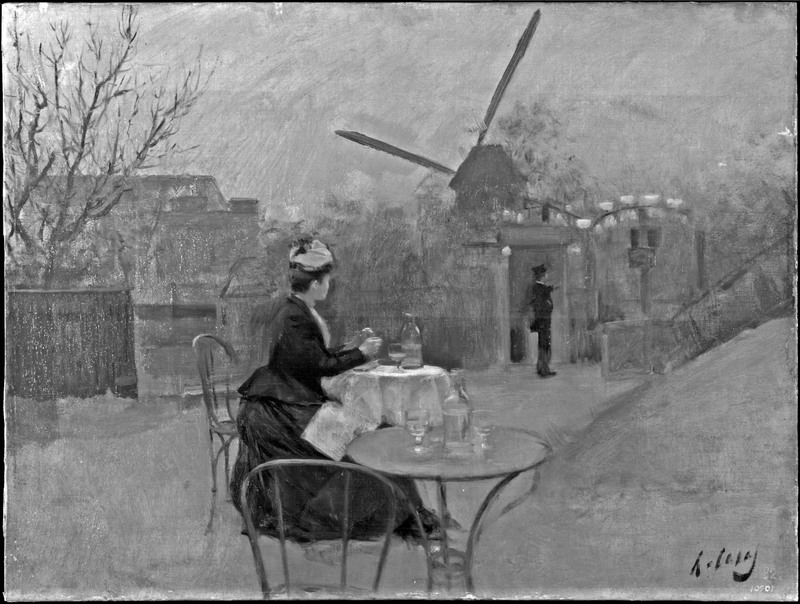 All these aspects are wholly in keeping with the style of painting in the open air, called plein air, so typical of the period. While the reflectograms are revealing a simple work in its execution and approach, Casas’s skill makes it a beautiful painting full of nuances. 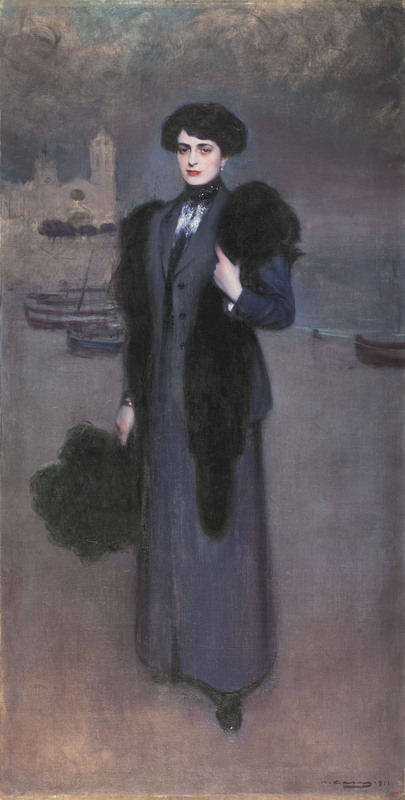 Finally, we have studied a female portrait from his mature period, Portrait of Dolors Vidal (1911). 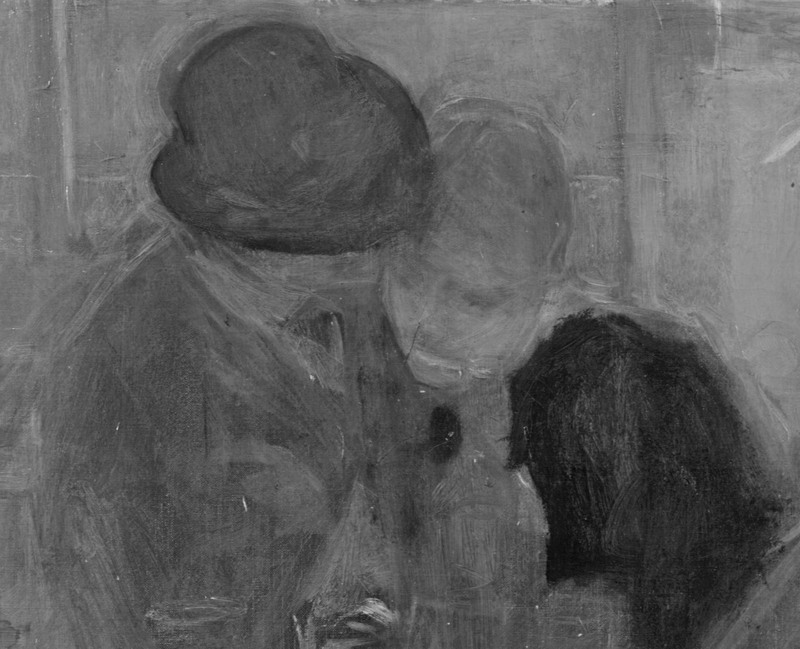 It is in this canvas where the underlying drawing appears more obviously and similar to the work that Ramon Casas has left on paper. 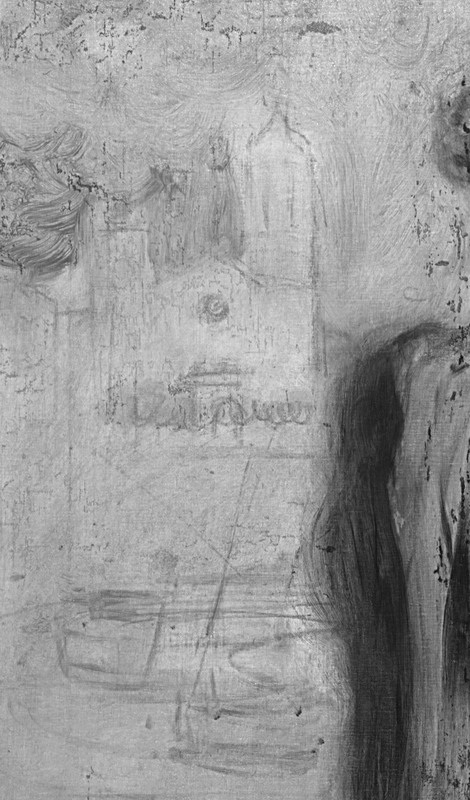 The reflectograms have revealed a rich charcoal drawing, which recalls the famous drawings in his extensive portrait gallery. The schematic way of expressing the trees in front of the church and the barely sketched boats are significant. 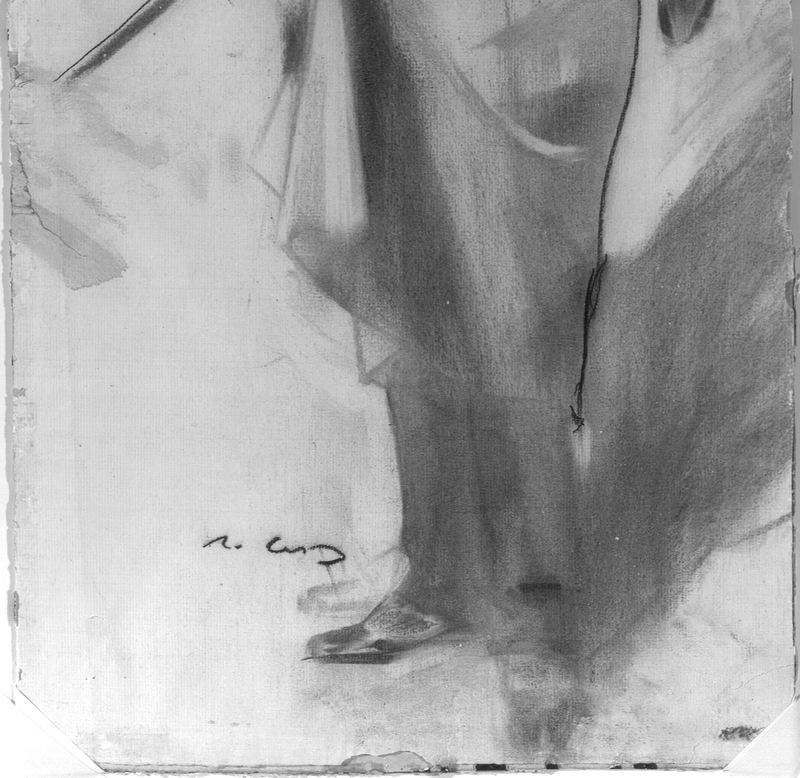 However, what is most striking is that in the Portrait of Dolors Vidal, Casas is not sure about the position of the feet and the final position of the figure, as is often the case with some charcoal drawings. 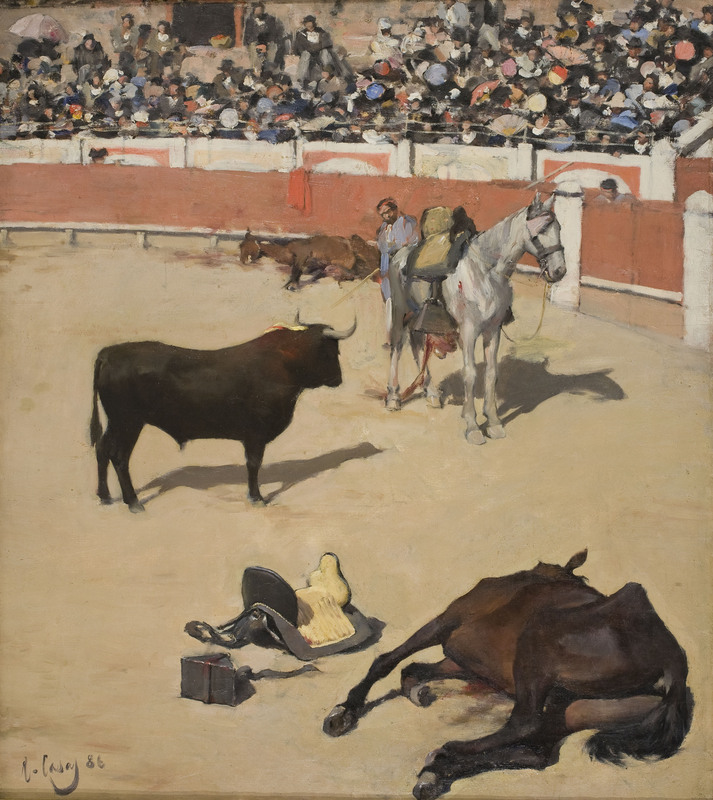 The extensive work by Ramon Casas conserved in our Museu Nacional d’Art de Catalunya – 31 oil paintings and around 500 drawings and posters – constitutes a very important point of reference for comprehensive knowledge of the artist. The work with infrared reflectography that we present here is added to a series of non-destructive studies that we are doing continually and which are intended to offer a view that is different to the documentary and bibliographic contributions known up to now. 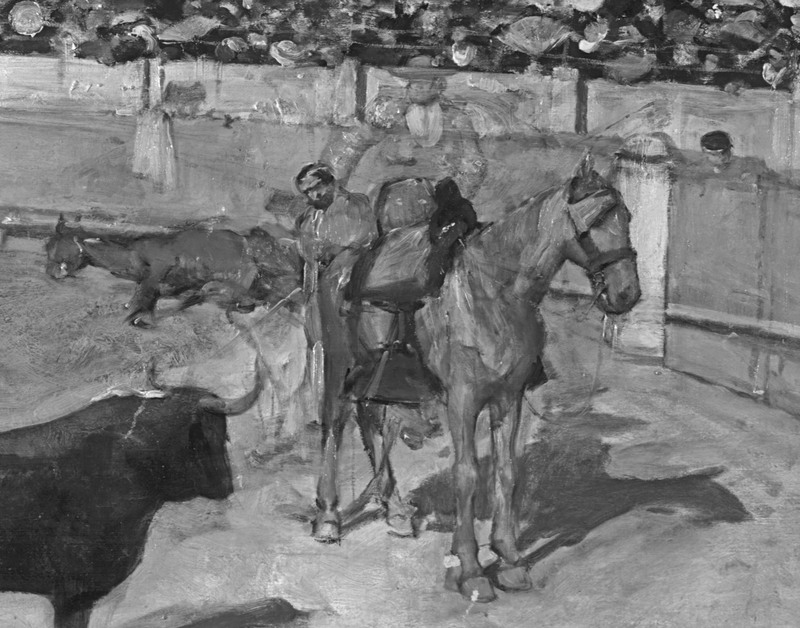 El proceso creativo de Ramón Casas. Estudio de su obra mediante reflectografía infrarroja, en el Museu Nacional d’Art de Catalunya, Mireia Campuzano, Núria Pedragosa, Carme Ramells.